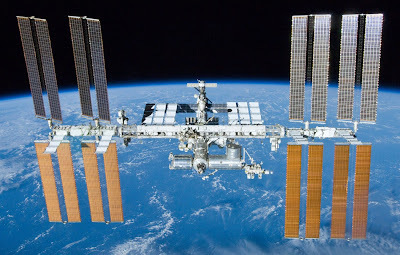 The decision to investigate the concept of a low-earth orbit space base for my Master's thesis was twofold: At the time in 1979, NASA's Shuttle program was in full swing, and the International Space Station (ISS) was the next planned step in the space program. The prospect of lots of available material from NASA as well as a little research at JSC Houston didn't hurt, since the problem of human habitation in contained, weightless environments was an interesting one to address. Secondly, the issue of the need to have a station in low earth orbit was identified as being about leveraging human technology and resource exploration in a way that moved mining and industrial operations out of the biosphere, as well as developing scientific research capacity. NASA had sponsored the famous Stanford Study in 1975 which examined the Stanford Torus, followed later by the Bernal Sphere. My thesis is a Design Problem Identification, which looks at the need for a full on-orbit infrastructure for space development and exploration, after laying out a relevance tree to accomplish this. Well, NASA moves at a snail's pace and so finally the thesis was presented to NASA at the University of New Mexico's Thermophysics in Microgravity: Expanding the Frontiers of Space, Feb. 5, 2003, the first Space Colonization Conference. The following year, there was a fun event at JPL for the kids called Exploring Mars, which I participated in via my indentured servitude to the Space Settlement Competition, and participating as a Structural Engineering Specialist and Judge. NASA's related studies are here. Actual planetary content of the moon and Mars are here. And 50 years of space exploration in one image is here.Current information on the impact of long-term space habitation on the human body is here. The world is increasingly aware that fundamental changes will be necessary to meet the growing demand for energy. There are many possible scenarios about what may emerge in the foreseeable future. Four such scenarios were constructed by the Millennium Project and are presented here (excerpt from the 2006 State of the Future) and rely on space development for energy sources. Other concepts include that of miniaturization and streamlining, which includes population reduction. One example of proposed off-earth energy sources is a solar belt around the moon, from Japan in the wake of the Fukishima disaster. Other proposals have been developed for a Space Solar Power Workshop 2013 at Michigan Tech. The entire "space program" is stuck in old memes. Shoot off the rocket. The "captain" as explorer and hero. Those days are done. Now it's a matter of developing on-orbit infrastructure so that industrial development (energy, mining, earth studies - big data) is off-earth. Intelligence is demonstrated in developing resources by doing no harm, and allowing the earth to heal and regenerate. An excellent discussion of the use of asteroid resources as a means of space colonization is here. The growing development of satellite orbital infrastructure is instrumental in fighting climate change by providing the data we need to make intelligent decisions about it. 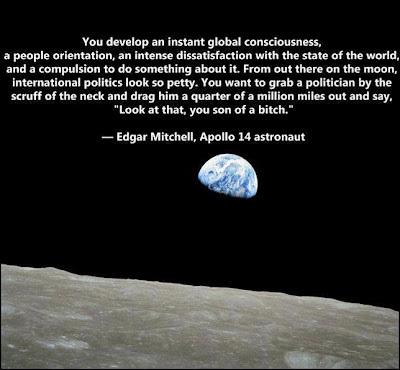 It also helps us to see that we don't need an excuse to weaponize off-earth systems, which only promotes conflict and is based on outmoded ideas of nationalism bounded by the geographic lines on the planet. They are irrelevant once we go beyond the planetary boundaries, as the International Space Station and moon landings demonstrate; it's vitally important to recognize our primary self-interest in life and the preservation of the ecosphere and its inhabitants. Resources need to be conserved and sources other than earth should be considered. According to Vitaly Sevastyanov, a Soyuz astronaut, there is enough helium in the Moon to power all human needs for at least a century. Indeed, the binding energy of helium is much higher than nuclear fission and even than hydrogen nuclear fusion. However, the space race has opened new and easier sources like space solar power satellites. The Wall Street Journal makes the case for private space development, as well as the case against it. It would appear that private enterprise has now begun to win that argument. Currently, in 2016 there has been a re-iginition in the of development of space exploration, satellite information gathering and, sadly, the militarization of near-earth space. This is discussed here in a video from the Smithsonian, based upon a Goldman Sachs report.